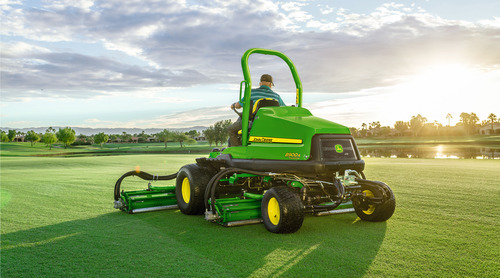 The 26in (66cm) cutting units are available in five, eight or 10 blade versions, with optional fairway tender conditioners and rear roller power brushes to further enhance cutting performance. The larger 30in (76cm) cutting units have five or eight blades and allow higher capacity mowing. Precision adjustment of both these units is a simple task thanks to the ingenious SpeedLink system, which is proven on John Deere’s existing fairway mower range. Rated at a maximum 48.3hp (36kW), the powerful, direct injection four-cylinder diesel engine features LoadMatch transmission settings to provide consistent cut quality and excellent climbing performance. In addition, turning speed can be slowed down to a set percentage of the mowing speed when the cutting units are lifted after a pass, which greatly reduces scuffing.